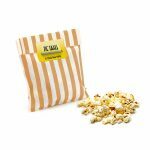 A striped Candy Bag filled with 20g of popped salted corn. Branded with a semi gloss sticker to the bag. American Popping Corn, *Butter Salt Flavour, Refined Rapeseed Oil, *Salt, Flavouring, Anti-Caking Agents (E341(iii), E551), Antioxidant (E392). WARNING: Un-popped Kernels may be present in product (3% max). May contain Nuts. Nutritional information, Typical Value per 100g: Energy 1700kj, 404kcal, Fat 10.5g, of which saturates 0.8g, Carbohydrates 65.2g, of which sugars 0.8g, Fibre 14.1g, Protein 12.9g, Salt 1g.